Column: Rick Priestley, "This gaming life - The turning of the year"
It’s a sorry sight to see the pale gold leaves of autumn once more carpeting the lawn in remembrance of another summer gone, not least because I have to sweep it all away! It’s a task fraught with such concealed hazards as rotting windfalls, backache, and the spoor of assorted fur and feather. Bitesize battle: Arvid Kappe, "A Frostgrave three-part mini campaign - A howl in the darkness"
Beyond the vast ruins of Frostgrave is an expanse of empty tundra, empty apart from the occasional patch of pine forest or forgotten mountain peak. This sweeping wilderness is now criss-crossed with newly-etched paths in the landscape, all leading to the once pr oud city. 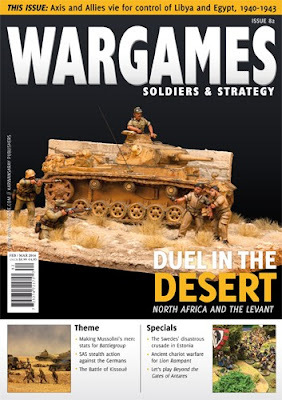 Feature: Pat Lowinger, "A Bronze Age supplement for Lion Rampant - Chariots Rampant"
For many wargamers, the Late Bronze Age holds a wealth of wargaming opportunities, as well as a tangible connection to the ancient world. This was a time of heroic combat characterized by the clashes of mighty armies led by elite cadres of chariotmounted warriors. This was a time of pharaohs, kings, and warlords. Whether your interests lie with the fast-striking armies of Ancient Egypt or the nigh-unstoppable might of the Assyrian Empire, the rich history of the chariot era awaits you. Feature: Michael Leck, "Swedish steel in the conquest of the Baltic - The Swedish Crusades"
According to the Eric Chronicles, King Eric rallied knights, farmers, and servants from the entire Swedish realm in what was known as the Ledung fleet, to combat the heathens. The King appointed Birger as the leader of the crusade. The chronicles tell us that the men were well-armed with weapons, helmets, and armour, and the women cried as the men embarked to sail acr oss the Baltic Sea. Feature: Gary Mitchell, "A 25mm-ish Zombie skirmish scenario - Pride prejudice and zombies"
“It is a truth universally acknowledged that a zombie in possession of brains must be in want of more brains.” Wise words, indeed. In 2008, Quirk Books editor Jason Rekulak developed the idea for Pride And Prejudice And Zombies, after comparing a list of popular fanboy characters like ninjas, pirates, zombies, and the usual suspects with a list of public domain book titles, such as War and Peace, Crime and Punishment, and Wuthering Heights. Out of copyright equals fair game. Theme: Guy Bowers, "The Italian war in the desert - Mancò la fortuna, non il valore"
The war in the desert, from 1940 to 1943, was quite unique in many ways. It was fought over vast expanses of open terrain, with some actions resembling sea battles. On the whole, troops had to be carried in vehicles and supply was vitally important; petrol and water were paramount. It also involved few civilians and generally lacked the atrocities that haunted other theatres of war. There was a mutual respect for their opponent from each side; even chivalry at times. Theme: Warwick Kinrade, "Representing the Regio Esercito on the tabletop - Making Mussolini’s men"
During my research and reading around the subject of the war in North Africa (something I’ve done quite a lot of over the past year or so, in preparation for writing the Battlegroup supplement that will cover the desert battles … well, at least the fighting in 1940-41), I have taken a special interest in the Italian Army. Theme: Mark Backhouse, "Black Ops mini campaig n in WW II North Africa - “Crystal palace would look small fry...”"
David Stirling’s attempt to create an elite raiding force to attack the Axis troops behind enemy lines in North Africa had an inauspicious start. The initial parachute raid in November 1941 was a total catastrophe. Of the 55 men who took part in it, 33 were captured or killed. A second raid a month later was considerably more successful, destroying fourteen enemy planes and damaging ten. But the jury was still out as to whether such raids were a worthwhile investment in time and resources. Theme: Arnold Blumberg, "The Batt le of Bir el Gubi - The Ram defeats the Lion"
General Sir Claude J.E. Auchinleck, British Commander-in-Chief Middle East, launched Operation Crusader on 18 November 1941. The aim was to relieve Tobruk and to throw the Italian-German foe out of Libya. The Eighth Army’s immediate objective was the destruction of the enemy’s armoured forces in Cyrenaica. To accomplish this, the main body of armoured strength (4th, 7th, and 22nd Armoured Brigades, 7th Armoured Division) would move north-west from the Egyptian frontier, with the mission of destroying the hostile armour near Tobruk, before lifting the siege. Theme: Eoghan Kelly, "The Battle for Kissoué, 15 June 1941 - A mixed show"
In May 1941, Allied commanders were increasingly concerned that Germany would attempt to use Vichy French territories in the Levant (the collective name for the French holdings in Syria and Lebanon) to launch attacks into either Egypt or Iraq. These concerns led to the launching of Operation Exporter, the code name for the invasion of Syria and Lebanon. As Axis aircraft were spotted using Vichy bases to send arms and equipment to anti-British forces in Iraq, skirmishes occurred along the border, as well as Allied attacks on Vichy airbases. These escalating tensions led Allied commanders to decide on a ruthless solution to the Vichy ‘problem’. Theme: Guy Bowers, "Building Mussolini's army in Africa - The Regio Esercito"
The Regio Esercito (Royal Italian Army) was reformed in 1861 as part of the Risorgimento. It lasted until 1946, when the monarchy was abolished and the modern Italian republic was established. The Italians were major players in the Western Desert campaigns and contributed to Germany’s campaigns in Yugoslavia and Russia. On the cover: Andres Amian and Philip Cocking, "High tide for the Axis in Egypt - Duel in the Desert"
The Battles of El Alamein marked the height of the North African campaign in World War II. The combined German-Italian army of the Deutsches Afrika Korps and Regio Esercito had pushed the British Desert Rats far back into Egypt, seemed poised to push on to Alexandria and Cairo. British officials burnt important documents in what was known as ‘Ash Wednesday’. Column: Jamie Gordon, "The Irregular - Computer dat... err, gaming"
“It is not the strongest or the most intelligent who will survive, but those who can best manage change.” This statement attributed to Charles Darwin sums up the theme of my article this month, as I will be exploring ways of exploiting developments in technology to enhance and progress our hobby. It’s safe to say that the world today is somewhat different from the way it was 25 years ago when I first started pushing lead around my parents’ dining room table, and this is particularly true in the field of technology. Hobby: Ruben Torregrosa, "Painting Deutsches Afrika Korps - A closer look at the DAK"
North Africa is one of the most exciting theatres of war in the Second World War. The dust, the heat, the difficulties of the terrain, the supplies … Rommel and the Deutsches Afrika Korps (DAK) did not have it easy. Nonetheless, they obtained victory after victory, until the Allies’ superiority in men, supply, and machinery finally won the war in Africa. Due to the supply difficulties, the German soldiers had to draw on anything available in the field, including uniforms from their Italian allies or captured from the British forces. Hobby: Stephen Tunmore, "Modelling realistic water on the tabletop - Water, water everywhere"
Trying to represent water in wargaming scenery on the tabletop can leave the average wargamer feeling a bit cold! Nothing seems to come close to realistically representing this medium. The default setting of blue/green strips of cloth, blue lino tile, or MDF painted blue with a coat of gloss varnish is purely representative. But with nothing else to turn to, the wargamer is left with little option. Let's play: Rick Hudson, "Hard Sci-Fi from Warlord Games - Let's play Beyond the Gates of Antares"
I love Warhammer 40,000, both as a system and a game milieu. So, when I learned that Rick Priestley – the man behind 40K and many other great games – had designed a new SF game, you would imagine that I’d be delighted. But to be truthful, I was somewhat ambivalent. Would Beyond the Gates of Antares match the unquestionably excellent standard of Rick’s previous output? Would I just be saying “it’s a bit like 40K, but ….”? Reviews: Paul Burkin, Rossco Watkins and Guy Bowers, "Game Reviews"
In this installment of our regular game review section, we take a look at Dragon Rampant, Skirmish Outbreak, Honours of War, and Tailfeathers. Column: Richard Clarke, "Up front - Leadership"
I’m always loathe to quote Sun Tzu in the presence of our esteemed editor, as I know that he gets overexcited and is liable to leap on the table and start singing The Big Sun’s greatest hits to the tunes of various rock classics. (True! Ed.) Clearly, an Auntie bought him the Sun Tzu Bumper Album from Woolies when he was a nipper and it scarred him for life.